MasterRents is a locally owned rental shop offering an extensive selection of heavy equipment for rent by the day, week or month, including a telehandler rental Massachusetts. MasterRents has more than 100 pieces of equipment and we offer delivery at reasonable prices. Along with our large fleet of equipment we also offer services for a telehandler rental in Massachusetts. No matter what type of equipment you need to get your task done correctly, our team at MasterRents can help you succeed. When it comes to precise load placement, you can rely on MasterRents for a telehandler rental in Massachusetts. We are always available to help customers who are in need of an affordable telehandler rental in Massachusetts, or any other type of heavy equipment rental or sale. We know what it takes to provide the necessary tools for your line of work, in the most efficient and affordable manner possible, and this includes a telehandler rental in Massachusetts. When you are in need of a telehandler or another specific piece of heavy equipment to complete your task, rely on our vast inventory and reliable experts working at MasterRents in Danvers, MA. Telehandlers are a valuable piece of heavy equipment because they possess the single most important action a construction forklift can perform, precision load placement. When you need to place a load with increased accuracy, there is no better option than a telehandler rental, Massachusetts residents. MasterRents can help by providing a top quality telehandler rental to Massachusetts individuals and businesses who need to possess the power of precise load placement. In many types of construction, the ability to do this is extremely vital. When precise placement becomes an issue in your construction work, a telehandler rental in Massachusetts is the answer. We can help you locate the correct machine that you might need, and we will also help get it to you, and assist you with any specific questions you may have. We are passionate and heavily involved heavy equipment specialists who know the in’s and out’s of a successful telehandler rental in Massachusetts. We are not simply people looking to rent out equipment to as many customers possible. Rather, we are a team who cares for each customer as an individual, and works to maintain their complete satisfaction and takes into account their specific needs. When you are in need of an expert on your side for a telehandler rental in Massachusetts, look no further than Al Garber and his expert team at MasterRents. At MasterRents we want to give our customers a wide variety of equipment, which is why we have added telehandlers to our fleet. Whether you are a mason loading blocks for your project, an iron worker positioning steel beams atop a building, or a roofer placing bundles of tiles on a roof top, then MasterRents should be the call to make for a telehandler rental in Massachusetts. We know that with the right piece of heavy equipment you will be able to get the job done, quickly and efficiently, so you can stay productive. A telehandler rental can be quite valuable in Massachusetts construction projects, and we can provide top of the line equipment to help get your tasks taken care of, with minimal stress and maximum efficiency. We know what it takes to succeed as a telehandler rental service in Massachusetts, and we cannot wait to help you. Our team will work hard to ensure your satisfaction with a telehandler rental in Massachusetts. Tell us exactly what you need the machine for, and our knowledgeable experts will let you know if the piece of equipment is the right fit. 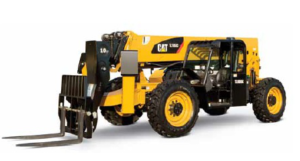 We are happy to help in every aspect of your purchasing or telehandler rental in Massachusetts, just let us know! MasterRents located in Danvers, MA, is a locally owned rental company with an ever growing fleet of new and late model heavy equipment. MasterRents is also part of the Cat Rental Alliance Program which gives us access to the full line of Caterpillar Equipment. MasterRents has a full time salesman Al Garber to assist with all your rental needs. Al has been in the equipment rental industry for over 20 years and is a customer service driven professional. If you would like to contact Al about rentals you can do so via email at AlGarber@MasterRents.com or by cell phone at 978-880-2727. All of our equipment is available for rent by the day, week or month. MasterRents looks to focus on the growing need for short term heavy equipment rentals with a focus on customer service. Our knowledgeable staff can help you with any questions you may have about your telehandler rental Massachusetts, or any of our other pieces of rental equipment. MasterRents offers short term rentals at reasonable prices, and our team can help outfit you with the absolute best options around. MasterRents is here to help you with any questions you may have about a telehandler rental in Massachusetts. We have a full time salesman as well as a knowledgeable staff who handle all of your rental needs. MasterRents offers short term rentals at reasonable prices; please contact us at 978-762-RENT (7368) for more information. We are located just 20 minutes north of Boston in Danvers, Massachusetts. Again, MasterRents is part of the Cat Alliance Program which opens the door to a wide variety of superb quality equipment. We look forward to serving all of your rental requests. You will never have an issue with our customer service and the quality of our machines for rent or for sale. There is no question that we are committed to the satisfaction and success of each and every one of our customers, and we are always available for advice, as we are heavy equipment rental experts. We have decades of experience in this industry and our team knows what it takes to make sure all of your needs are met. Remember, when it comes to a telehandler rental for your Massachusetts construction job, look no further than the team at MasterRents in Danvers to help you find and obtain the best equipment options, contact us today!